How a Can a Small Business Get an ERP Implementation Project Right. Do I have the capacity to be able to take key members of staff in key roles out of their day jobs to devote their time and skills to help implement an ERP? Does my internal team have the capability and experience required to deliver the project? Is our infrastructure able to cope with the demands of an ERP system? Which ERP system is the best fit for my business? Are the current business processes robust enough to incorporate into an ERP? Will we need to integrate with other systems or will the ERP do everything we need? How do we ensure we keep the financial impact of the project manageable? How do we ensure our employees are ready to cope with the changes and able to use the system upon go live? With so many tales of failed business and systems change projects, especially ERP, it can make the decision making process feel overwhelming and full of risk. Larger businesses and organisations are able to withstand the costs and absorb the risk involved with far more ease than a small business. 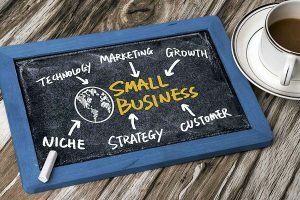 To a small or midsize business, however, making that transition into business grade systems in the wrong way has the potential to cause irreparable damage. So it’s paramount that the project is undertaken in a robust and structured way to ensure the business benefits are delivered and the business risks are minimised. Why do small businesses need ERP? The small business market is now more competitive than ever. The unknowns of Brexit, the unpredictability of the current financial markets and the speed and frequency of start-up businesses disrupting the market have brought in even more challenges than ever before. So in order to not only keep up but thrive in this environment, small businesses need to ensure they have adequate business systems in place which support the business operations and facilitates business growth. The need is really no different to big businesses. And just like big businesses, they also need the understanding and analytical insights required to make business-critical decisions which is one of the benefits of a well-implemented ERP. However, Sarah Watts, Head of Information Services at The Institute of Directors highlights the following as one of the biggest problems for small businesses, ‘’Organisations don’t have meaningful performance measurements in place or carry out regular performance analysis.’’ (See full IoD article here). One of the key reasons for this is that they don’t have the business systems in place to support this. Beyond this, the Zurich Insider Report highlighted one of the key challenges for small businesses in 2016 would be skills shortages. However, it’s not all about problems with the education system and recruitment. We see lots of opportunity to upskill existing teams through our holistic approach to people, process and system improvements. All too often only one part of that triangle gets tackled at a time. And all too often the opportunity is missed during an ERP implementation. Which is the perfect opportunity to upskill your team – but instead far too much of the focus is just on the system itself. The other aspect is that with a well implemented ERP system and efficient processes, the dependency on key individuals and expert knowledge can often be reduced with more automation. So in summary, it could be argued that small businesses need ERP just as much as the larger firms. So how should a smaller business approach an ERP implementation project to enable success and provide their business a platform to thrive and achieve their growth targets, not just now but in the years to come? There is a simple answer to that question. Seek out independent, impartial, expert ERP advice. Now before you say ‘that just adds to the financial cost’ or ‘that’s a service designed for larger, enterprise-level business’, allow me to elaborate. Yes, of course, there is a cost. However, that cost will pay dividends in the long run. Bringing in independent and impartial ERP advice is not just a service that is only affordable or applicable to larger businesses. At Optimum PPS, we are devoted to providing the services, affordability and advice that is tailored to the needs and requirements of any business. Our mission statement is to deliver success with ERP by doing things differently. Doing things better. We are a small, growing, ambitious company ourselves and get great satisfaction in helping other businesses on their growth journey. Our holistic approach brings together the 3 essential elements required for ERP implementation success: People, Processes and Systems. By helping you identify and improve these 3 areas we are able to develop a robust solution that fits any businesses budget, requirements and targets. Whether that be finding a new ERP system that fits best into your business plans, refining the existing processes to drive out more efficiency and value or optimising your existing systems. We will ensure your business is best placed to take advantage of the full benefits and value of ERP. We have proven experience of working with SMEs as on-going, trusted partners. Helping them to continually adapt to changing environments as and when they need to. An example of this kind of relationship expertise can be seen in our work with Fern Plastics. Helping them drive continuous value from their systems over many years has played a part in their continued growth and stability as a business. You can read our Fern Plastics case study HERE. If you are looking to start your first ERP project get in touch HERE and we can start to help your business achieve ERP success.